A clump of about 5 seedlings have been grown in this pot to provide instant screening. The Golden Cane palm is a clustering palm, with up to about a dozen golden coloured trunks, but no main trunk. The trunks curve out from the base, while the feather leaves recurve as well. One of the most popular palms in the tropics and sub-tropics, due to its ease of growth, and attractiveness. Used for both landscaping duties (especially as a screen, even hedge), as well as an indoor plant. 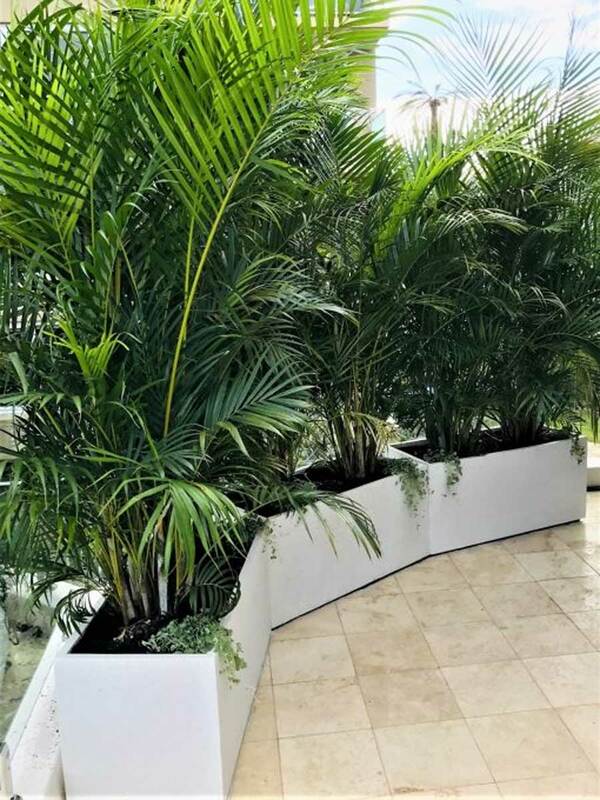 There is almost no limit to the uses of the golden cane palm, and because it is easy to grow and readily available, it has become a landscaping standard. It also can be used as a specimen palm to show of its golden canes, especially if older leaves are pruned. In cooler climates, the golden cane palm is commonly used in interior design to add a tropical touch. Takes about 6 years to reach its maximum height - note it will be faster in warmer areas, slower in the cooler zones. Full sun to indoor part shade. Water well when establishing, to produce a drought hardy plant when mature. Mulch well (but keep mulch away from the trunk to prevent collar rot). Fertilise in spring/summer with an organic fertiliser such as manure and/or fertiliser specific to palms (3:1:3 or 3:1:2 N:P:K).